For other uses, see Chris Long (disambiguation). Christopher Howard Long (born March 28, 1985) is an American football defensive end for the Philadelphia Eagles of the National Football League (NFL). He is the son of Pro Football Hall of Fame member Howie Long. He played college football at Virginia, where he was recognized as a unanimous All-American. He was selected by the St. Louis Rams as the second overall pick in the 2008 NFL Draft. Long has also played for the New England Patriots, winning a championship with them in Super Bowl LI in 2017. The following season, he won Super Bowl LII with the Eagles, who in turn defeated the Patriots. He won the Walter Payton NFL Man of the Year Award for 2018. Chris Long was born in Santa Monica, California and is a son of Hall of Fame NFL defensive end Howie Long. He has two younger brothers, Chicago Bears offensive lineman Kyle Long and Howie Long, Jr., a scouting assistant and personnel assistant for the Oakland Raiders. He is a great-nephew of film director Irvin Kershner. He appeared in a 1980s anti-underage drinking public service announcement as an infant with his parents. Long attended St. Anne's-Belfield School in Charlottesville, Virginia. As a senior in 2003, he was in on 91 tackles, 23 tackles for a loss, and 15 sacks, helping his team to an undefeated record and the state UIL school championship. "He was a big gangly kid who had yet to grow into his body," said John Blake, the St. Anne's-Belfield coach. "But he jumped in with both feet. When he played tackle, he would drive kids 10 or 15 yards down the field, like he was steering a car." He was given a 4-star ranking for college recruiting from Rivals.com, a service that rated him the sixth-best defensive end in the prep ranks. He played in the 2004 U.S. Army All-American Bowl. Long had the rare distinction of having his jersey retired at St. Anne's-Belfield School. Long also played basketball, lacrosse, and baseball in high school. Long played college football at the University of Virginia under head coach Al Groh from 2004 to 2007, while pursuing a degree in sociology. As a freshman in 2004, he was a backup on the defensive line, but missed five games due to mononucleosis. Long ended the season with five tackles (two for a loss) and a sack. As a sophomore in 2005, Long averaged 3.8 tackles per game, leading all Virginia defensive linemen. He totaled 46 tackles, with 10 tackles for a loss and 2 sacks. His 26 quarterback pressures led his team. He also shared the team lead in pass break-ups with seven. In 2006, Long earned second-team All-ACC honors and was voted team captain. While starting all games, Long recorded 57 tackles, 12 for a loss, and 4 sacks. His 4.8 tackles per game was fourth among ACC defensive lineman. He was also a finalist for the Dudley Award, for the most outstanding player in the Commonwealth of Virginia and was an All-State selection. Following his senior season in 2007, Long was recognized as a unanimous First-team All-American. Long was fourth nationally in tackling by a defensive lineman, averaging 8.3 tackles per game. In addition, North Carolina head coach Butch Davis, who coached against Long in North Carolina's ACC match-ups with Virginia, called Long one of the premier defensive linemen in the country. Long entered the 2007 season on the watch lists for the Outland Trophy, Bronko Nagurski Trophy, Bednarik Trophy, Lombardi Trophy, Hendricks Award, and the Lott Trophy. He finished the season as a finalist for the Lombardi, Lott, and Nagurski Trophies. On December 5, Long won the 2007 Hendricks Award, given to the top defensive end in the nation. Long garnered more than 60 percent of the votes, the most ever for a winner in the history of the award. Additionally, Long received a first-place vote and finished 10th in the 2007 Heisman Trophy voting. 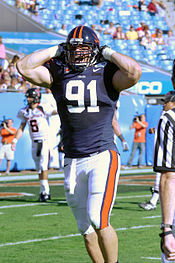 Although he never completed his degree, Long's #91 jersey was retired at the University of Virginia on November 24, 2007, making him the first to have his jersey retired while an active player. At the NFL Combine, Long did not lift the bench-press reps of 225 pounds because of an injured thumb. Long was drafted by the St. Louis Rams second overall in the 2008 NFL Draft. The selection made him just the second son of a Hall of Famer, after tight end Kellen Winslow II, to be drafted in the first round, the fifth such player ever drafted, and one of two such players drafted in 2008 (the other being Matthew Slater). Following the draft, Rams head coach Scott Linehan named Long a presumptive starter on defense, a notion that Long rejected and instead felt he needed to earn a spot as a starter. The Rams also announced their plans on using Long as both a linebacker and defensive end to showcase his athleticism. Long considered his ability to play multiple positions one of his best assets. On July 19, 2008, Long agreed to terms on a six-year $56.5 million contract with the Rams with $29 million guaranteed. On September 14, 2008, Long recorded his first career sack against Eli Manning of the New York Giants. He recorded his first 2-sack game versus the New England Patriots on October 26, 2008. At the end of his 2008 rookie season he was voted All-Rookie by the Pro Football Writers Association and Sporting News. Long started 16 games (14 at right DE and 2 at left DE) for the Rams in 2008, recording 4 sacks and leading the team in quarterback pressures, with a high of two sacks against the New England Patriots. In 2009, Long again played both left and right defensive end for the Rams and ended the season with 5 sacks, which was second on the team. He also led the team's defensive linemen with 43 tackles (33 solo plus 10 assists) and for the second straight season he led the Rams in quarterback hits/hurries. Chris Long at a game in Denver in November 2010. In 2011, Chris Long decided to change his jersey number from 72 to his former collegiate number 91, which was previously worn by Leonard Little. On September 17, 2011, the Rams and Long agreed to a restructuring of his contract to free money under the salary cap. The restructured deal included a $12.1 million signing bonus and a base salary in excess of $10 million in 2012. Including the prorated signing bonus amount, Long had an $18.3 million cap number for the 2012 season. On October 30, 2011, Long had a career-high 3 sacks versus the New Orleans Saints and was named Sports Illustrated's NFC Defensive Player of the Week for his efforts. And for the second consecutive season he led the NFL in quarterback disruptions. Long also led the Rams in quarterback hurries with 15 and quarterback hits with 16. For his efforts Long was voted the Defensive Lineman of the Year by the NFL Alumni for the 2011 season. He was also voted as an alternate to the Pro Bowl for the second time. On July 29, 2012, Long and the Rams agreed to a four-year contract extension. The extension added $50 million over 4 years, with $27 million guaranteed. Counting the existing year of contract (2012) which was reworked in 2011, Long's overall deal ended up at $60 million over 5 years, with $37 million guaranteed. In 2012 Long led the Rams in sacks with 11.5 and again led the team in quarterback hits (24) and hurries (50)  Additionally, according to Football Outsiders.com Long led NFL defensive ends in hurries for the third straight season. On December 30, 2012, Long tied a career-high of 3 sacks versus the Seattle Seahawks. Long's additional honors included being named to the USA Football's All-Fundamentals Team for the first time. He was also voted as a Pro Bowl alternate for the third time. On October 24, 2013 Long was fined $15,750 for throwing a punch at Carolina Panthers offensive lineman Chris Scott early in the third quarter Against the Colts, Long recovered an Andrew Luck fumble and ran it in for a touchdown, his first NFL score, and was named co-NFC Defensive Player of the Week by Sports Illustrated (along with Robert Quinn). Long ended the 2013 season with 8.5 sacks and took his career total to 50.5 sacks and was named to the All-Fundamentals teams for the second consecutive season. Also in 2013 Long was voted first alternate defensive end to the Pro Bowl, the fourth consecutive season he was an alternate. Once again for the sixth consecutive season he led the Rams teams in quarterback pressures with 39, but was second in quarterback hits to All-Pro Robert Quinn. On September 10, 2014, Rams head coach Jeff Fisher announced Long would spend two months recovering from ankle surgery. The injury reduced Long's 2014 season to six games. Long played 12 games for the Rams in 2015. He was released by the team on February 19, 2016. On March 18, 2016, Long signed a one-year deal with the New England Patriots worth $2 million. Long appeared in every game, starting in seven, and made solid contributions as a situational player on a team that went on to go 14–2 in the regular season, capture the AFC Championship, and win Super Bowl LI, his first NFL championship. Long played an important role in a critical play helping the team to a dramatic comeback victory. The Patriots trailed 28–3 in the third quarter, but rallied all the way back to win the game by a score of 34–28 against the Atlanta Falcons, which featured the first overtime game in Super Bowl history and the largest comeback in Super Bowl history. Although not appearing in any statistical category during the game, Long played a crucial part in the team's comeback when Falcons offensive lineman Jake Matthews was called for holding Long on an eight-yard catch that would have put the Falcons at the Patriots 26-yard line for a potential game-sealing field goal. Instead, the Falcons were pushed out of field goal range and the Patriots were able to tie the game on their following possession. On March 28, 2017, his 32nd birthday, Long signed a two-year contract with the Philadelphia Eagles. Long announced that he would donate his entire 2017 salary to charity, with the money going to a different charity each week. Long said in a statement: "I hope it won’t stop here, but that more people will become inspired to commit energy and resources to our educational system. It will be the number of people invested in this cause that will be the difference maker for a quality education for every student in America. Education is the best gateway to a better tomorrow for EVERYONE in America." Long played in all 16 games in the 2017 season, recording 5 sacks and a career high 4 forced fumbles. He added 4 tackles, 2 pass deflections, and a fumble recovery in 3 postseason games. Long, along with fellow ex-Patriot, LeGarrette Blount, defeated their former team, the New England Patriots, in Super Bowl LII with the Eagles, the two becoming just a handful of players to return to the Super Bowl with a new team the season after playing for the reigning champions the previous year. On June 22, 2013, Long married Megan O'Malley in Charlottesville, Virginia. O'Malley is a graduate of the University of Virginia and former member of the UVa women's lacrosse team. The couple welcomed their first child, a son named Waylon James Long, on March 2, 2016. Their second son, Luke Redding Long, was born on November 26, 2018. In May 2015, Long launched The Chris Long Foundation which helps raise money for the Waterboys.ORG Initiative. The initiative is dedicated to building wells for communities in East Africa. In 2017, Long stated that he would donate his entire salary for that year's NFL season to charity. ^ a b Himmelsbach, Adam (November 24, 2007). "Chris Long Depends on Hard Work More Than Famous Name". The New York Times. The New York Times Company. Retrieved June 19, 2008. ^ Finley, Patrick (October 2, 2015). "Long story: Bears' Kyle welcomes little bro, Raiders". Chicago.SunTimes.com. Retrieved December 4, 2016. ^ Caldwell, Christopher (January 27, 2017). "Pats' Solutions". The Weekly Standard. Retrieved August 20, 2018. ^ "Howie Long For United Way | Commercial". Retrojunk.com. December 5, 2006. Retrieved December 29, 2010. ^ a b c d e f "Chris Long Biography". VirginiaSports. University of Virginia. July 19, 2007. Archived from the original on February 16, 2012. Retrieved June 19, 2008. ^ Lawrence, Kan (December 18, 2007). "Talib Officially Named Consensus All-America By NCAA". KU Athletics. CBS College Sports Networks. Archived from the original on December 24, 2007. Retrieved June 19, 2008. ^ "Long Wins Hendricks Award as Nation's Top DE". VirginiaSports. University of Virginia. December 5, 2007. Archived from the original on July 9, 2012. Retrieved June 19, 2008. ^ "2007 Heisman Voting". Fantasy Sports Outlook. December 8, 2007. Archived from the original on June 22, 2008. Retrieved June 19, 2008. ^ "The day Chris Long gave a season of NFL checks to charity". ^ "Virginia Honors Tiki Barber and Chris Long by Retiring Jerseys". VirginiaSports. University of Virginia. November 25, 2007. Archived from the original on July 9, 2012. Retrieved June 19, 2008. ^ Dagger (February 29, 2008). "2008 NFL Combine Results". postgameheroes.com. Retrieved June 19, 2008. ^ McDonald, Jerry (April 21, 2008). "Chris Long Q&A". Inside the Oakland Raiders. Northern California Network. Archived from the original on June 26, 2008. Retrieved June 19, 2008. ^ Coyle, Frank (February 25, 2008). "Long lives up to hype at Combine". Rivals.com. Retrieved June 19, 2008. ^ "Chris Long". NFLDraftScout.com. The Sports Xchange. Retrieved June 19, 2008. ^ "Dolphins, Rams take Jake, Chris Long; Falcons go with Ryan". Draft Central. ESPN. Retrieved April 26, 2008. ^ Owens, Bruce (June 14, 2008). "For NFL Rookies, The Real Father's Day Comes This September". The TMR Zoo. Retrieved June 19, 2008. ^ "Rams first-round pick Long agrees to six-year deal". ESPN. July 21, 2008. Retrieved December 29, 2010. ^ "Americanchronicle.com". www.americanchronicle.com. Archived from the original on September 13, 2012. ^ 314-340-8233, Kathleen Nelson knelson@post-dispatch.com. "Fisher minimizes lack of Pro Bowl love for Rams". ^ Van Bibber, Ryan. Turf Show Times Retrieved September 28, 2011. ^ a b "Chris Long, St. Louis Rams reach four-year contract extension". ^ http://www.mlive.com/lions/index.ssf/2012/02/detroit_lions_matthew_stafford_23.html Detroit Lions' Matthew Stafford named Quarterback of the Year by the NFL Alumni MLive.com. Retrieved January 15, 2012. ^  Three Rams named Pro Bowl alternates December 29, 2011. ^ Jim Thomas, St. Louis Post-Dispatch, via Twitter,  Retrieved July 31, 2012. ^ Fisher minimizes lack of Pro Bowl love for Rams Retrieved December 30, 2012. ^ Rapid Reaction: Seahawks 20, Rams 13 Retrieved December 31, 2012. ^ http://usafootball.com/all-fundamentals-team/2013 USA Football All-Fundamentals Team. Retrieved January 15, 2014. ^ "Chippy Game Between Carolina Panthers, St. Louis Rams Draws $47,250 in Fines". Archived from the original on January 31, 2017. Retrieved October 28, 2013. ^  USA Football All-Fundamentals Team. Retrieved January 15, 2014. ^ Sessler, Marc (September 10, 2014). "Chris Long expected to miss two months after surgery". NFL.com. Retrieved September 10, 2014. ^ Sessler, Marc (February 19, 2016). "Rams cut Chris Long, James Laurinaitis, Jared Cook". NFL.com. Retrieved February 19, 2016. ^ "Patriots sign DE Chris Long and LB Shea McClellin". New England Patriots. Archived from the original on January 31, 2017. Retrieved March 19, 2016. ^ Staff and news service report (March 1, 2017). "NFL notebook: Chris Long leaving New England". ^ Smith, Alex (March 28, 2017). "DE Chris Long Added On Two-Year Deal". PhiladelphiaEagles.com. Archived from the original on January 25, 2018. Retrieved March 28, 2017. ^ Sessler, Marc (March 28, 2017). "Philadelphia Eagles to pad D-line with Chris Long". NFL.com. ^ Mather, Victor (October 19, 2017). "Chris Long of the Philadelphia Eagles to Donate Entire Salary" – via NYTimes.com. ^ "Pledge 10 for Tomorrow". PledgeIt.org. ^ "Chris Long and LeGarrette Blount could make history in Super Bowl LII". January 23, 2018. ^ "Philadelphia Eagles win Super Bowl. Chris Long was voted to the 2018 Payto LII". NFL. Retrieved February 4, 2018. ^ "Chris Long Stats". ESPN. ESPN Internet Ventures. Retrieved February 24, 2015. ^ "Chris Long Will Begin Visiting Teams After Birth Of First Child". yardbarker.com. February 29, 2016. ^ "Free Agent DE Chris Long Announces He's A Father With Adorable Photo". foxsports.com. March 4, 2016. ^ "The Chris Long Foundation". ^ "Waterboys Initiative". Archived from the original on June 2, 2015. ^ "Chris Long will donate every game check for 2017 to charity". Retrieved October 20, 2017. ^ "Endorsements". Archived from the original on August 22, 2016. Retrieved August 1, 2016. ^ Brandon, Kayla (July 27, 2016). "Republicans Who've Jumped Ship to Support Libertarian Gary Johnson for President". Independent Journal Review. Retrieved August 1, 2016. ^ @JOEL9ONE (August 31, 2017). "Gary lost me pretty early" (Tweet) – via Twitter.